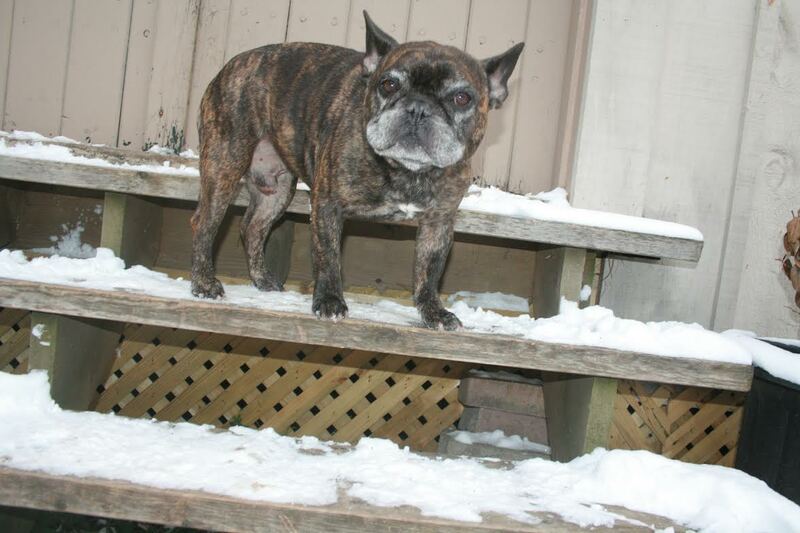 Senior French Bulldogs Need a Home for the Holidays – UPDATE! 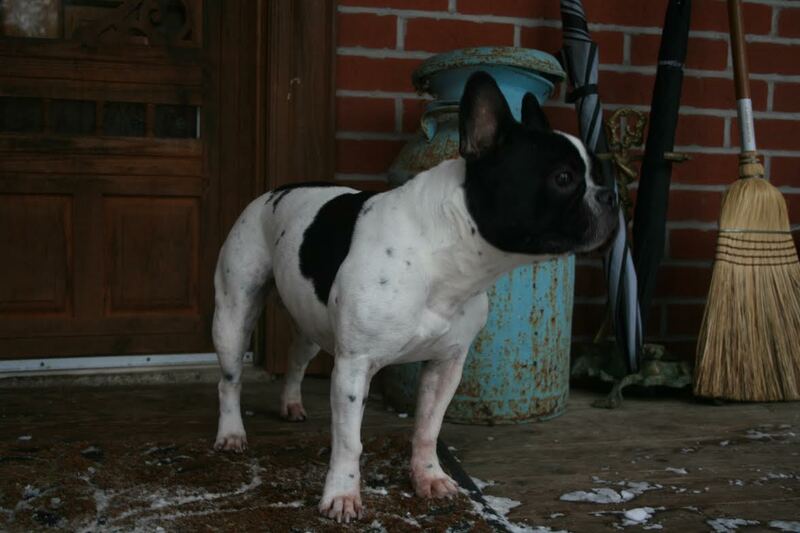 Thank you to all who have shown an interest in our two senior Frenchies. We have been inundated with enquiries and are quite moved at the overwhelming response to them. We apologize for the delay in responding to your enquiry but please be advised that we are carefully going through all applications and will be following up with all qualified applicants in the next 3 to 5 days. At this time, we’re not accepting further applications for their adoption. Thank you once again for your interest – it’s truly inspirational to see how many people have reached out and offered to give them a home! The lovely little pied girl is spayed, housebroken, lead trained and very sweet. She does have some ongoing skin allergies, which can managed with proper diet. She is approximately seven years old. Her brindle best friend is neutered, clean in the house, lead trained, affectionate and very eager to please. He does not mark in the house, from what his foster home can determine. He is approximately seven and a half years old. Both dogs seem fine with adults, children and other dogs. They are so far untested with cats, but we suspect they will be fine. They are obedient, healthy and very eager for affection, although a little confused and unhappy about their abandonment. Because they are so pair bonded, they MUST BE PLACED TOGETHER. The dogs are being boarded in the GTA area of Ontario, Canada. They must be adopted by a home willing to undergo a home visit, and to complete an application and pay the ECFBC placement fee. Because of their special circumstances, one fee will be waived. They will NOT be shipped, and must be picked up in person. We can’t emphasize what a loving, sweet, well behaved pair of dogs these are. They just need a stable home where they can give back as much love as they get. Please note: at this time, we’re not accepting further applications for their adoption. Remember, sharing is caring – if you can’t adopt, please share. https://i0.wp.com/www.bullmarketfrogs.com/wp-content/uploads/2013/11/pair-faces.jpg?fit=1176%2C784 784 1176 Carol http://www.bullmarketfrogs.com/wp-content/uploads/2015/06/bullmarket-logo.png Carol2013-11-28 22:48:122013-12-03 18:00:17Senior French Bulldogs Need a Home for the Holidays - UPDATE! Join us Saturday, December 7th at Pet Outfitters in Durham for our First Annual Christmas Party! Make sure to print out our flyer, for coupons good for December and January! December is also the beginning of our food and supplies drive at Pet Outfitters for the Grey Bruce Animal Shelter – this area’s only no kill shelter. Like all no kill shelters, they receive ZERO dollars in municipal or provincial funding, relying entirely on adoption fees and donations from the public. You can donate goods purchased anyplace, not just from Pet Outfitters, but ANYTHING you buy in store for the donation box is automatically 20% off. https://i0.wp.com/www.bullmarketfrogs.com/wp-content/uploads/2013/11/button-christmas.jpg?fit=881%2C655 655 881 Carol http://www.bullmarketfrogs.com/wp-content/uploads/2015/06/bullmarket-logo.png Carol2013-11-25 21:56:372013-11-25 21:56:37Christmas at Pet Outfitters!